Each of the above pictures shows a glacially transported boulder (erratic) that has settled on top of other glacially transported rocks. There is little doubt in each instance that the deposition of the erratic followed, or was simultaneous with, the deposition of the underlying glacially transported rocks. A clear sequence of events is indicated. First the underlying rocks were deposited, then an erratic settled on top of them. In this section, observations of erratics that have settled on top of bedrock frost-heave occurrences will be analyzed to determine which event occurred first, the frost heave or the deposition of the erratic. As will be explained below, this analysis is not always so straightforward as the analysis of the event sequencing illustrated above. 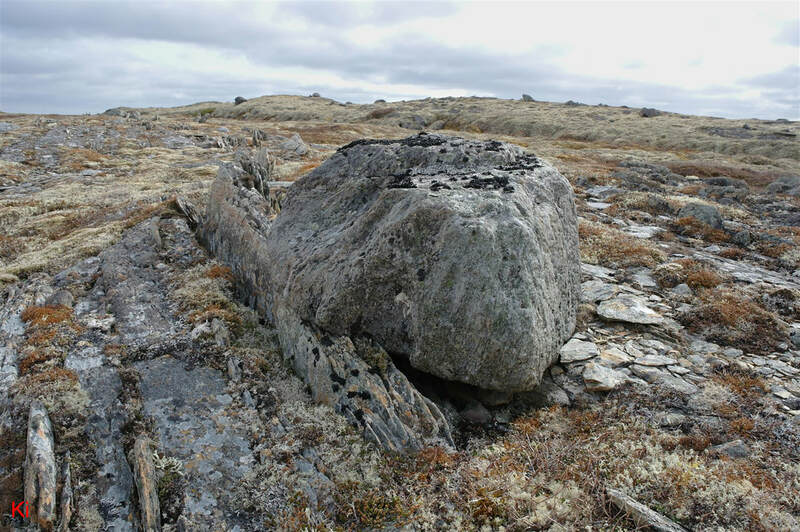 Why is it useful to analyze erratics resting on top of frost-heaved bedrock? If deglaciation is shown to follow episodes of bedrock frost heave, then a further important result is obtained: Late stage glaciation included intervals of cold based glaciation. The goal of using paleoglaciology to infer aspects of the pre-Holocene paleoclimate of the Avalon Peninsula requires a correct determination of event sequencing and the resultant conditions under which ice-induced disruption of bedrock occurred. 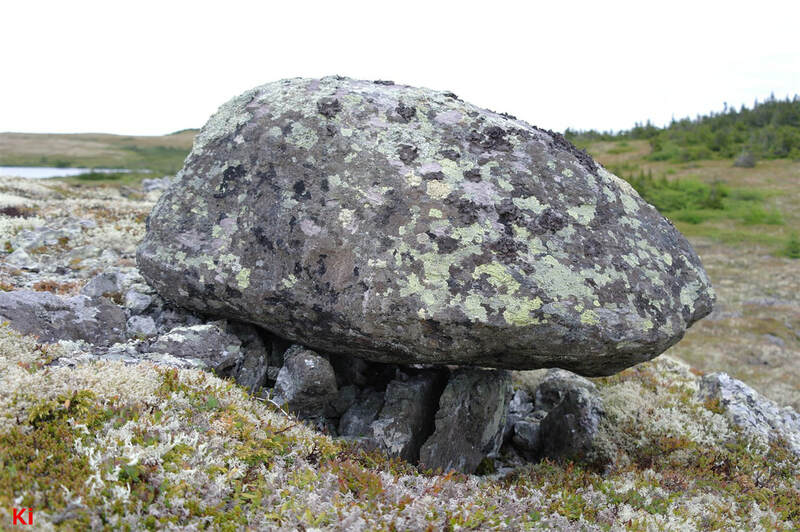 The movement of erratics provides definitive evidence of glacial activity. 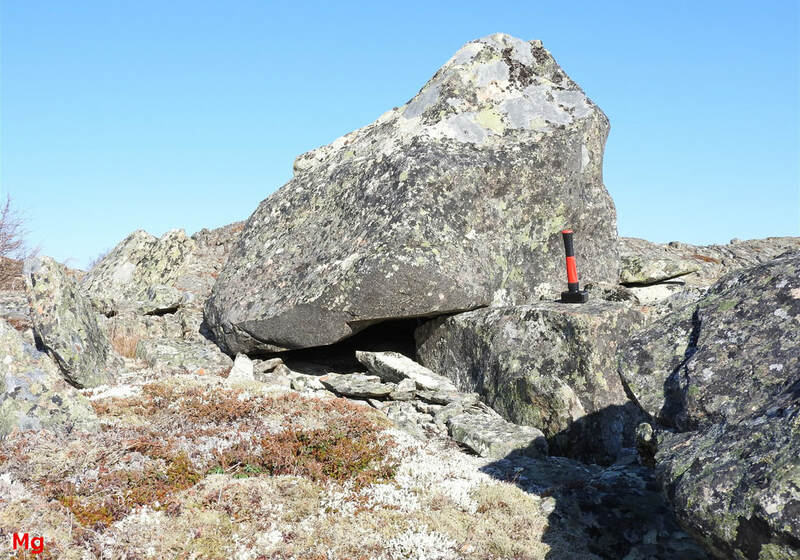 Observations of glacial erratics that lie on top of fragile frost heave occurrences can, in principle, offer convincing evidence as to the relative timing of deglaciation and bedrock frost heave events. The above photo shows a view along a glacially carved bedrock ridge about 1 km in length. Abundant occurrences of frost-heaved bedrock lie along the entire length of the ridge. The thinly-layered morphology of the frost heave occurrence shown in the foreground reflects the strongly foliated bedrock comprising the ridge. 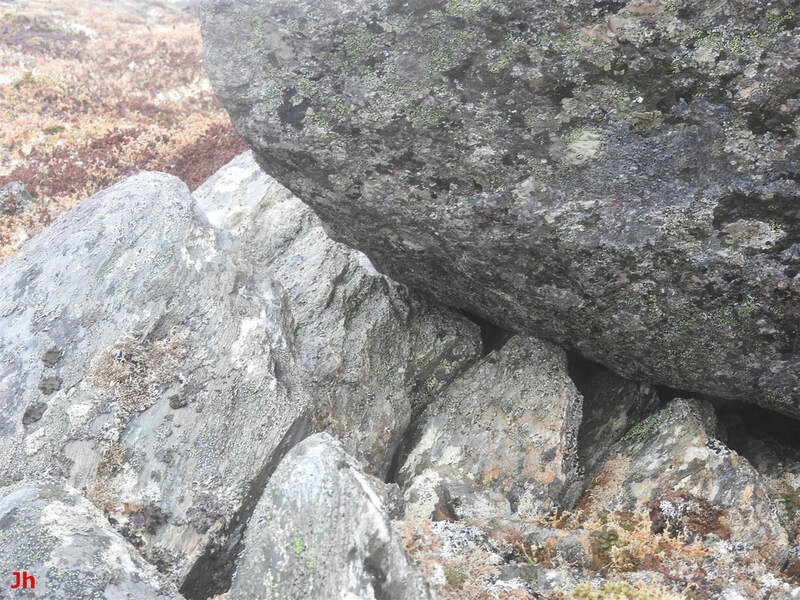 This type of frost heave occurrence is well suited for analysis of interactions with erratics because the size and weight of commonly-observed erratics are sufficient to tilt, break or deform the fragile individual frost heaved fragments. The above picture shows another view of the same ridge as shown previously. Note that erratics are scattered among occurrences of bedrock frost heave. 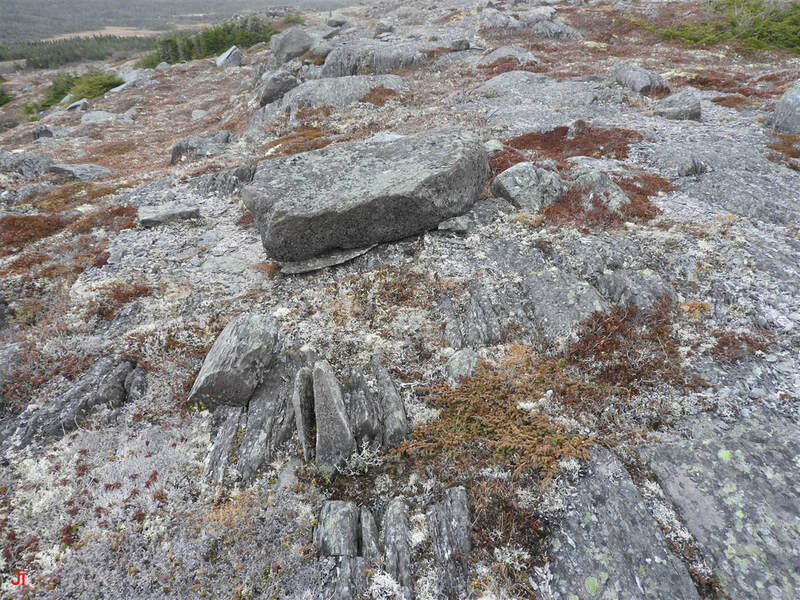 Instances of erratics directly overlying frost-heaved bedrock were found in the area of the above-illustrated ridge (see example in photo below). However, only a few situations were suitable for unambiguous analysis (see discussions following in this section). 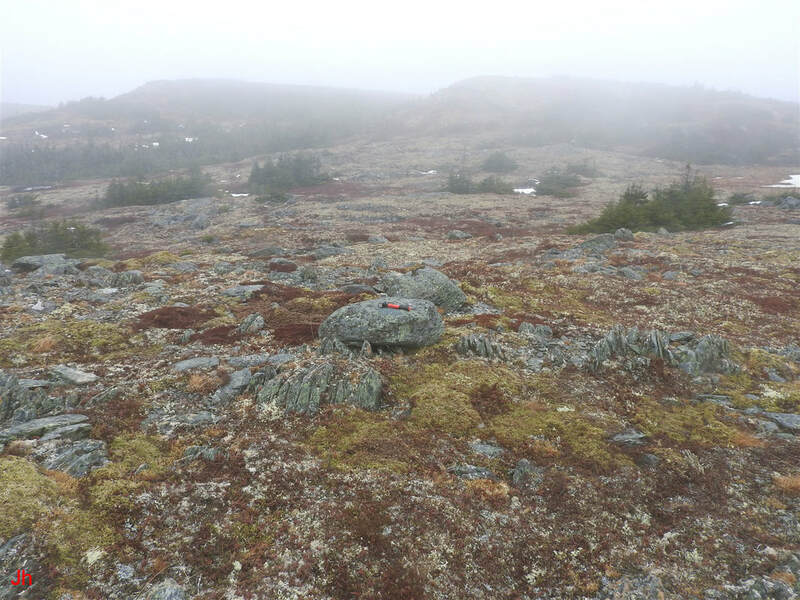 In total, several square kilometers of frost-heave-affected bedrock were searched for erratics, at the location illustrated above and at several other locations on the Avalon Peninsula. 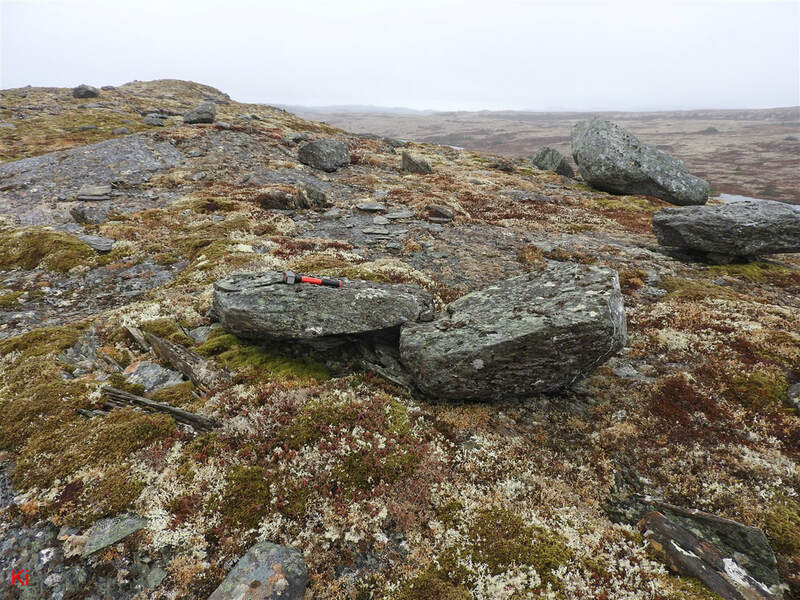 Although the number of erratics seen in the search area was uncountable, as was the number of bedrock frost heave occurrences, the number of discovered examples of erratics sitting directly atop frost-heaved bedrock was relatively small (approximately 30). The above diagram shows a possible trajectory for an erratic boulder (black ellipse) suspended in glacial ice. The boulder continuously sinks downward because of its negative net buoyancy, while simultaneously being lifted and transported horizontally by movement of the ice in which it is suspended. All ice movement and ice deformation is assumed to occur via creep only. The net motion of the boulder illustrated above is downward and to the right. Depending on the velocity regime of the suspending ice, the boulder could move upward, downward or tangential to the bedrock. Erratics perched on top of other glacially transported rocks or on top of steep, narrow bedrock outcrops, provide an indication of near-ground ice velocity that is not solely tangential to bedrock. 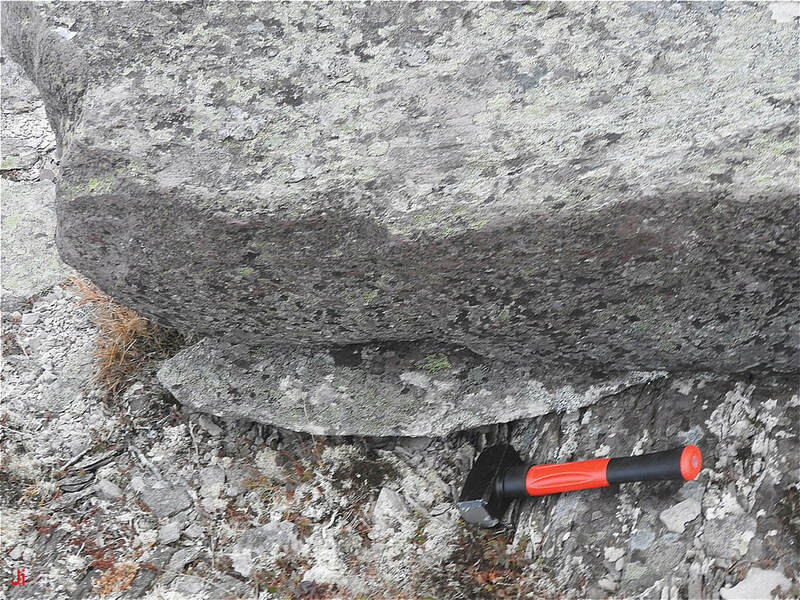 Many erratics are smoothed or rounded, indicating that they were dragged along at the base of a glacier, continuously wearing against basal rocks. 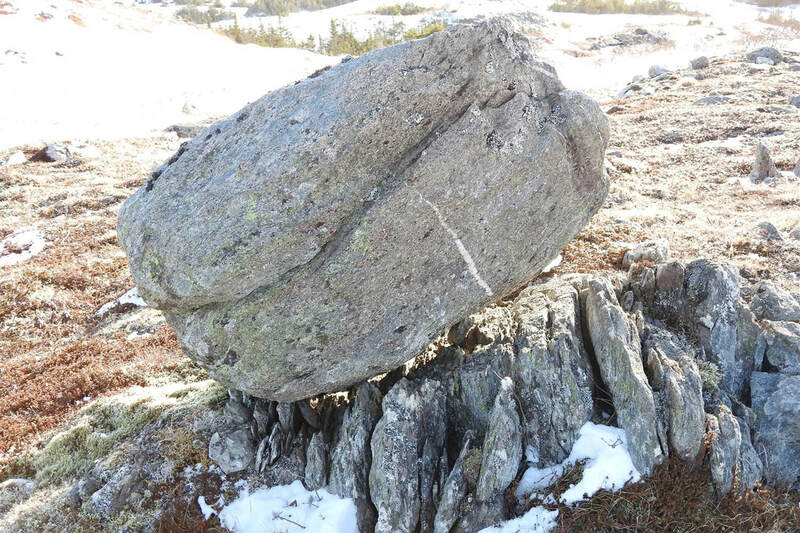 When an erratic is carried aloft by glacial ice, abrasive erosion ends and the erratic can eventually settle in a perched position, on top of other rocks. Ice motion that lifts an erratic boulder away from the glacier bed can, in principle, also move heat away from the bed. Removal of heat of crystallization, by advection as well as by conduction, is an important consideration in plausibly balancing the heat transfer equation for subglacial bedrock frost heave. The above illustration shows an erratic, assumed to have been deposited by a retreating glacier near the end of the Younger Dryas cold period. Following deglaciation, a periglacial climate ensues and frost heave occurs in foliated bedrock beneath the erratic. 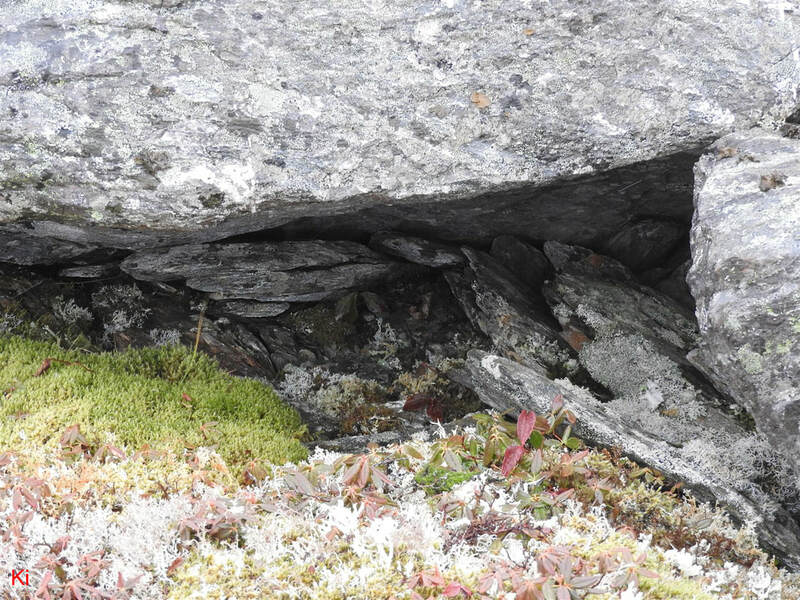 Frost-heave fragments are pushed up to register against the underside of the erratic boulder. In this event-sequence model, the frost heave is subaerial in origin and postdates deglaciation. The above diagram shows an erratic hoisted into an elevated perch by frost heave action in underlying foliated bedrock. 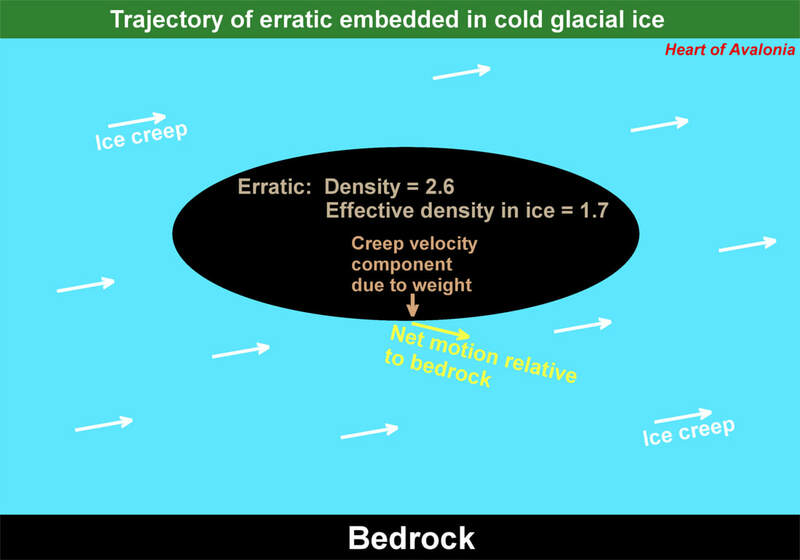 Pressures associated with ice segregation in a subaerial frost-heave environment would be adequate to lift overlying boulders in many instances. Thus, an observation of an erratic boulder perched on elevated frost-heave fragments can be explained within a subaerial, post-deglaciation descriptive model. The small erratic pictured above is underlain by a group of frost-heaved joint blocks. In this (ambiguous) example, it is possible that the erratic was already in place, with glacial ice having entirely retreated before the frost heave occurred. 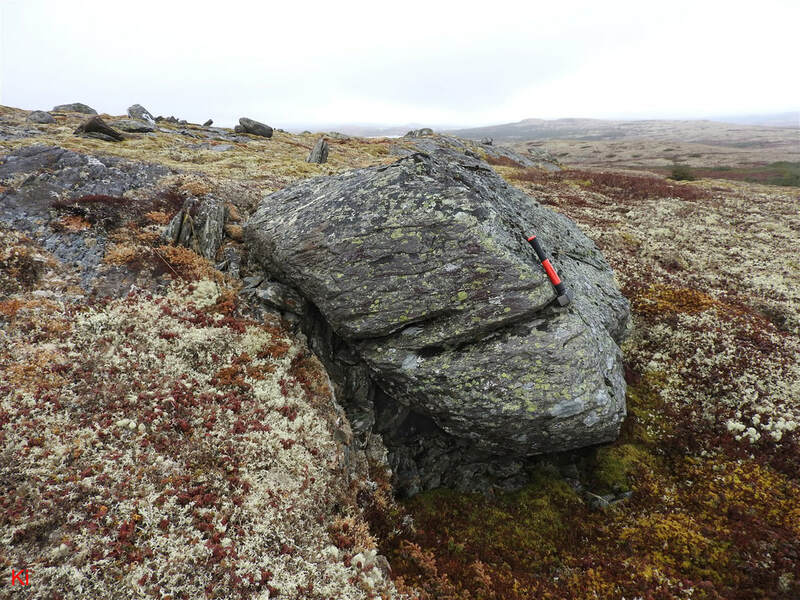 Four more (ambiguous) examples are provided above where frost heave, potentially occurring subaerially, could have lifted erratic boulders left behind by glacial ice that had fully retreated prior to an interval of periglacial climate conditions. 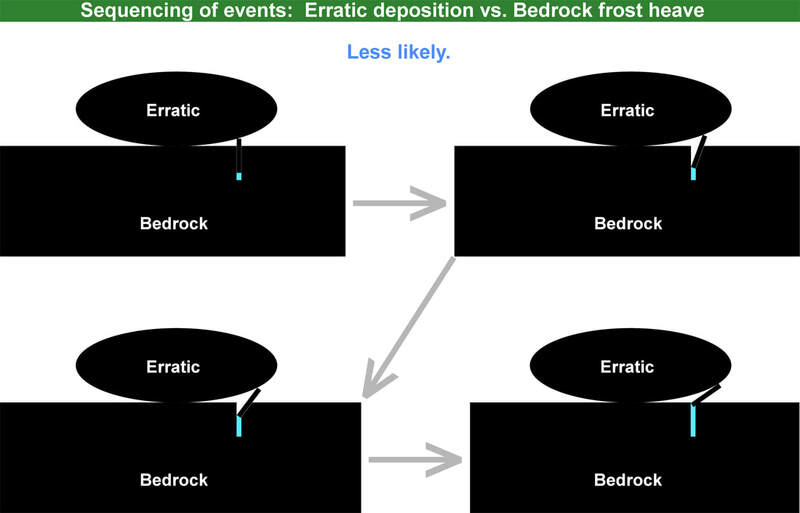 The ambiguity of interpretation of observations of erratics resting on frost-heaved bedrock is demonstrated by considering the two diagrams above. Note that the right-hand frames on both of the above diagrams match the respective right-hand frames on the two previous diagrams that were used to illustrate a tentative post-deglaciation, subaerial frost-heave model. In the above-illustrated descriptive model, the frost heave occurs subglacially (pre-deglaciation) and then an ice-borne erratic eventually settles onto the elevated frost-heaved fragments. In the first-illustrated instance, the weight of the settling erratic crushes the group of frost-heave fragments, driving them partially back down into the underlying cavity. 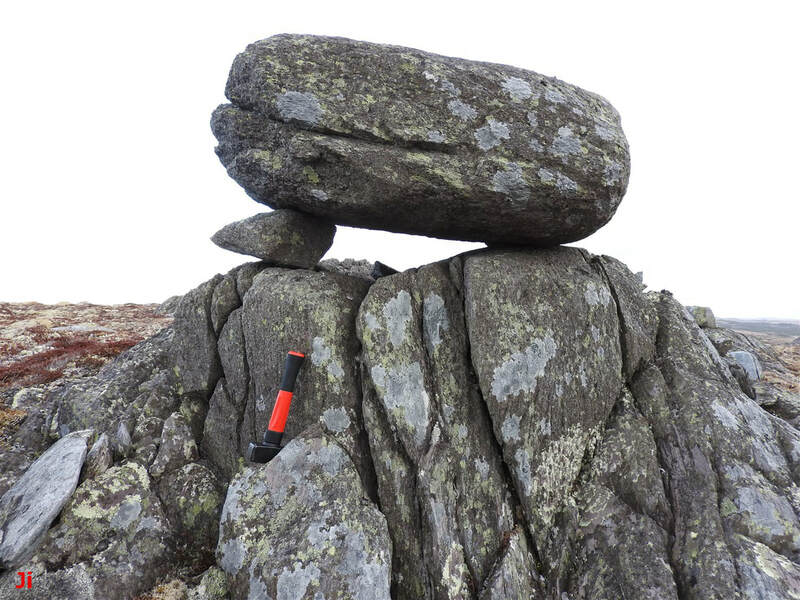 While general observations of glacial erratics lying on top of frost-heaved bedrock are subject to ambiguity of interpretation, certain special observations can provide a reasonable degree of certainty as to event sequencing. 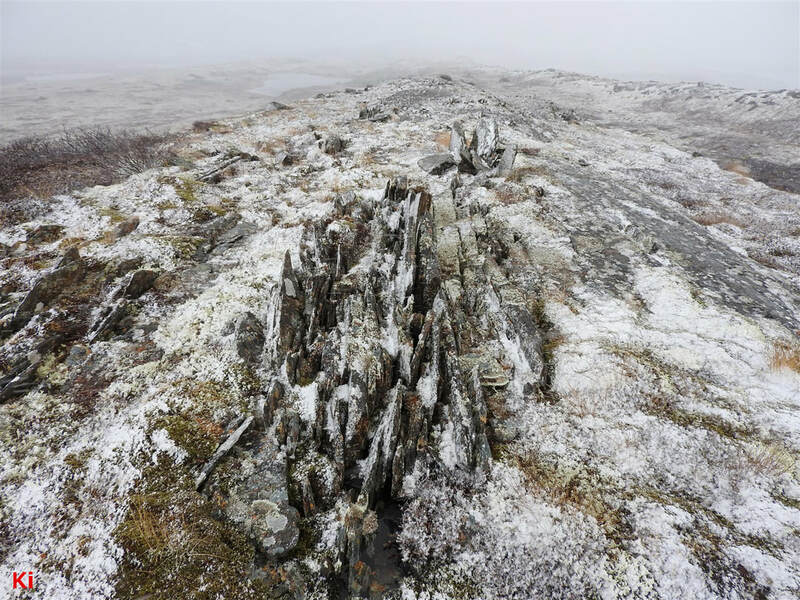 For example, when frost-heave fragments are seen rotated and crushed beneath an erratic boulder, it is reasonable to deduce that the corresponding frost heave event preceded the deposition of the erratic. This circumstance is illustrated in the above diagram. 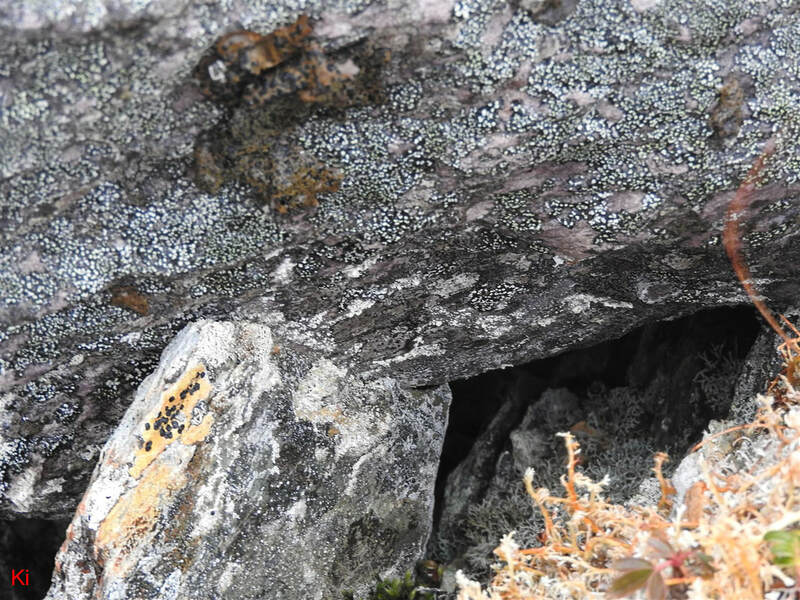 The following photos show instances where rotated frost-heave fragments were observed pinned underneath glacial erratics. 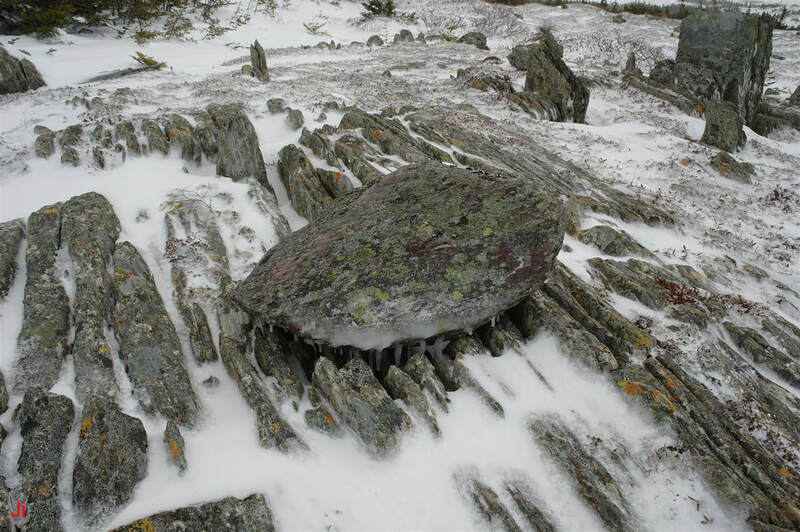 In the photo above, an erratic boulder is seen lying on top of a small occurrence of frost-heaved bedrock. Note also other nearby occurrences of thinly layered bedrock frost-heave slabs. Two groups are seen just left of the erratics, and one is seen in the bottom right corner of the frame. The foliation in this area dips vertically. The tilt of the frost-heaved slabs was caused by horizontal ice loading applied during or after the frost-heave event. The above photo shows a closeup of the view underneath the erratic sitting directly over frost-heaved bedrock. 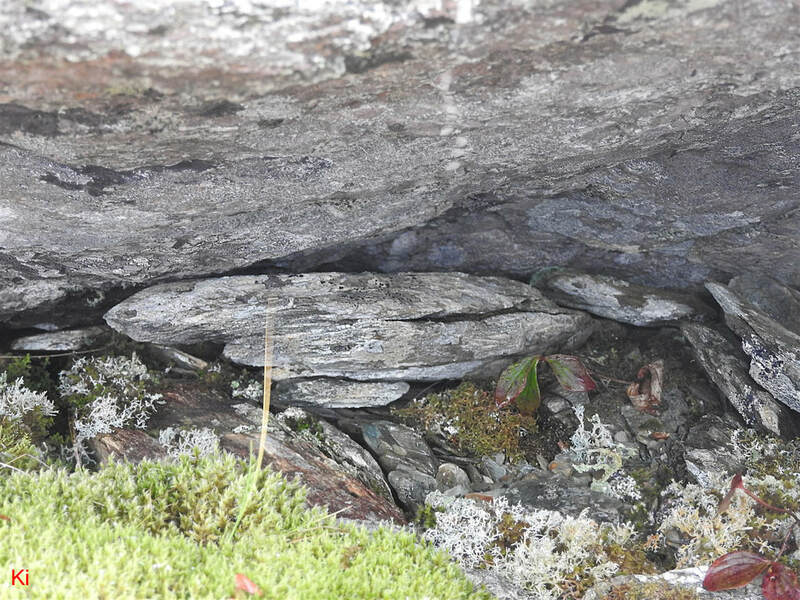 The frost-heave fragments have been tipped almost to a horizontal orientation, possibly by the direct action of the intrusion of the overlying boulder, or possibly by preceding horizontally-directed glacial ice loading. The frost-heave fragments shown above are crushed and pinned beneath the overlying erratic. These fragments might have been positioned by glacial ice movement prior to deposition of the erratic. 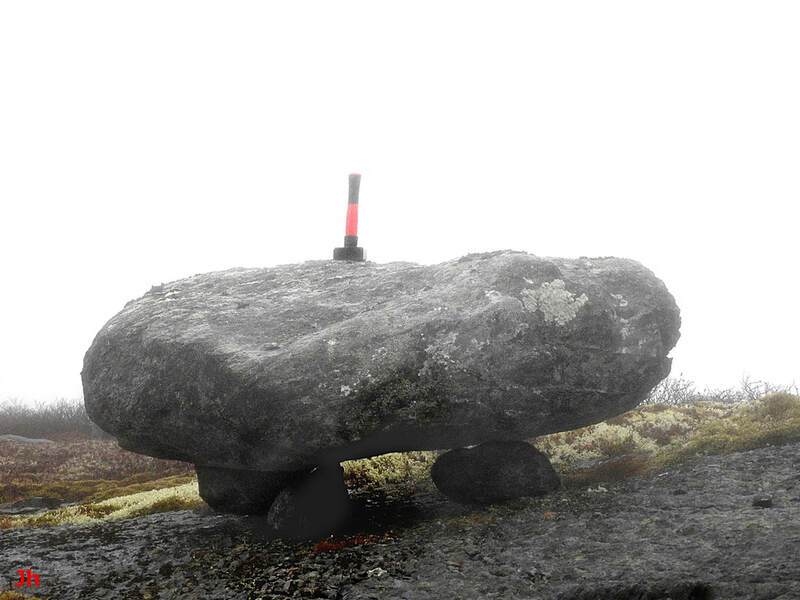 It is not considered probable that frost heave occurring after placement of the erratic would be able to account for the illustrated arrangement. Thus, the above photos suggest an event sequence: Bedrock frost heave preceding erratic placement (thus frost heave preceding deglaciation). 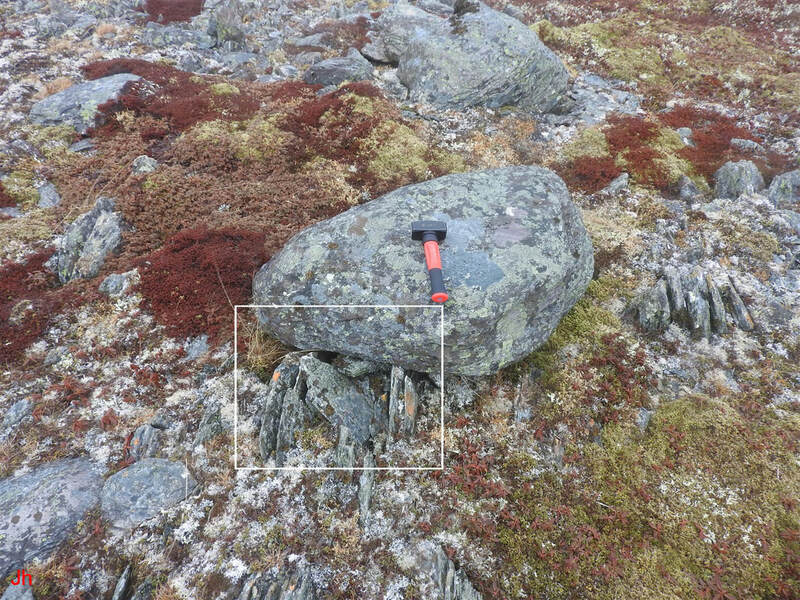 The orange hammer seen in the above photo rests on a small erratic boulder surrounded by several low outcrops of frost-heaved bedrock. As seen more clearly in the following closeup photo, a row of small frost-heaved joint blocks lies alongside the erratic. The photo below shows a closeup of the area outlined by the white box in the above photo. 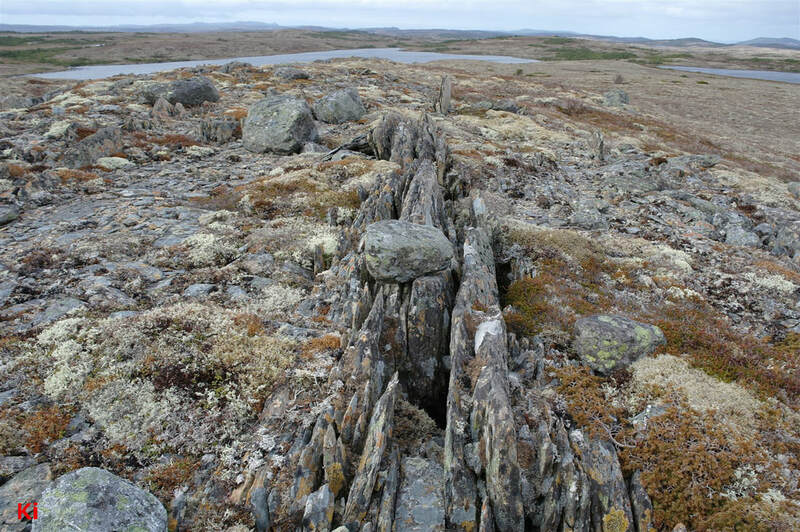 A row of five small frost-heaved joint blocks adjacent to the erratic is shown in the photo above. The two blocks on each end of the row are still rooted in bedrock, while the center joint block is partially dislodged and tipped toward the left. 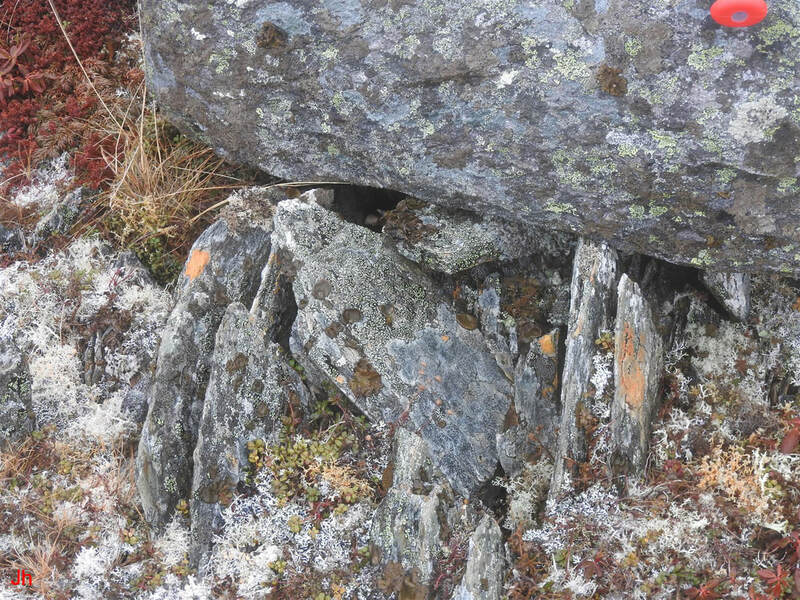 A close examination of the arrangement suggests that a sixth frost-heaved joint block from the same row is fully dislodged and now extends underneath the erratic. This fully dislodged block is shown in more detail in the photo below. The fully dislodged frost-heaved joint block is shown just to the left of center in the above photo. This block is jammed tightly underneath the overlying erratic. 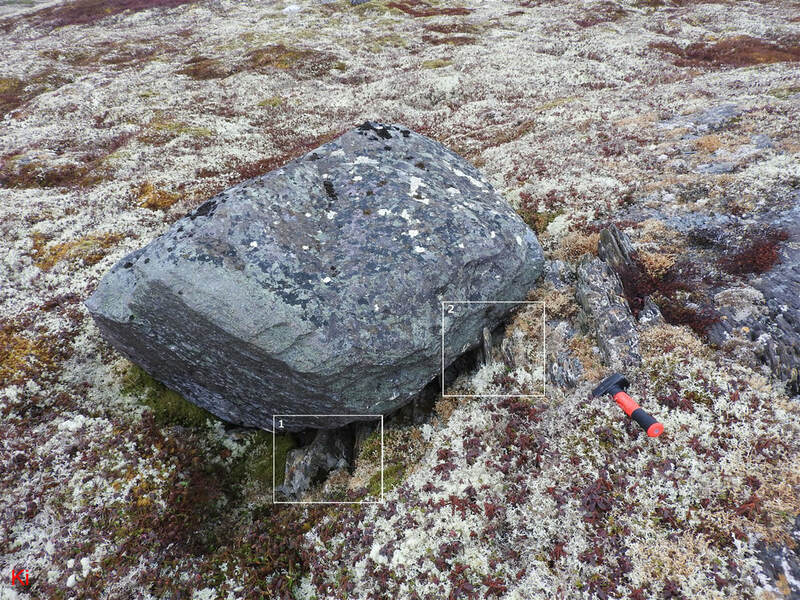 It appears from the illustrated arrangement that a frost-heaved joint block was caught and dragged by the erratic as the erratic descended from overlying glacial ice. Within this interpretation, the bedrock frost heave at this location occurred subglacially. 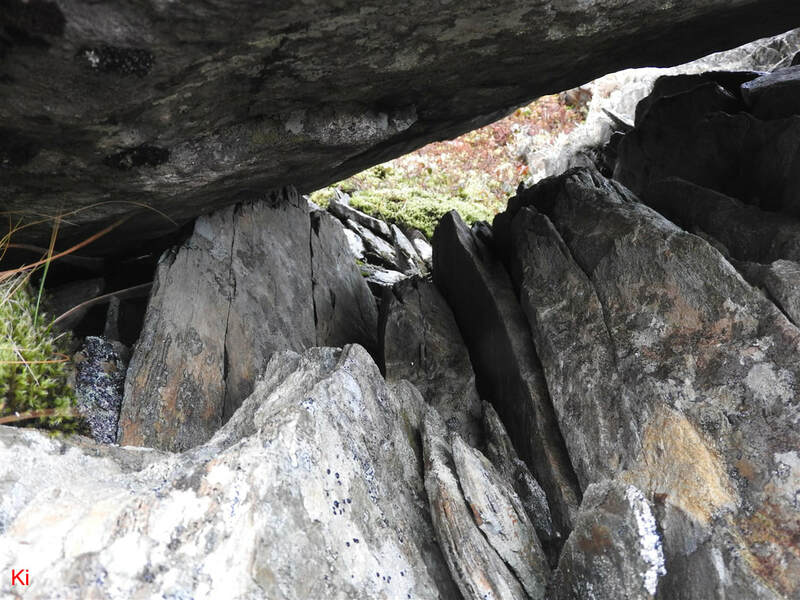 The above photo shows a slab of glacially transported rock lying on strongly foliated bedrock. Instances of bedrock frost heave, including large monoliths, are abundant in the immediate area. There are also numerous nearby occurrences of thinly layered smaller frost-heave monoliths. Many thin, loose sheets of rock, presumably of frost-heave origin, are scattered around on flat bedrock surfaces. It was determined that in this area, and in many similar locations, thin sheets of rock weighing less than a few kilograms are readily shifted by windstorms. 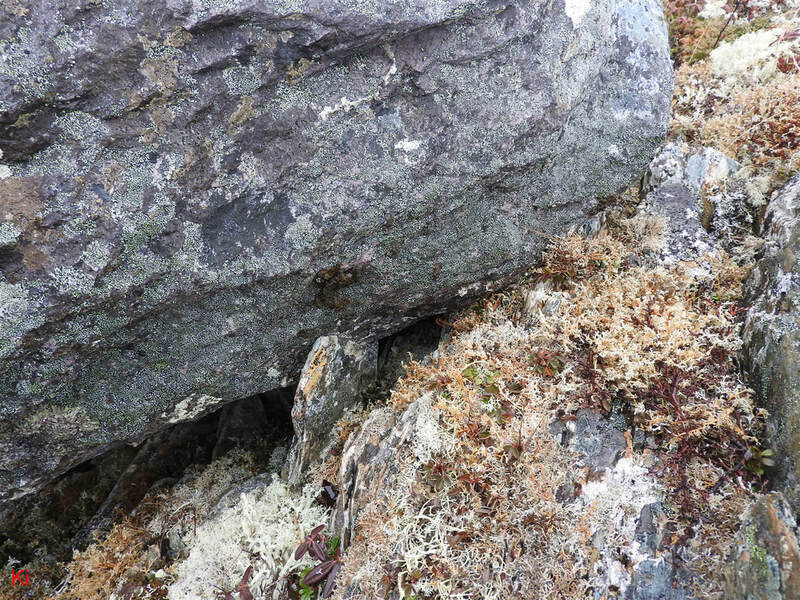 This deduction followed from observing loose sheets of rock overlying vegetation, or equivalently, from observing loose sheets of rock lying upside down, with lichen coverage on the underneath side. Thus, the scattering of smaller sheets of rock, originating via frost heave, does not necessarily imply that glacial activity occurring post-frost-heave shifted the rocks. 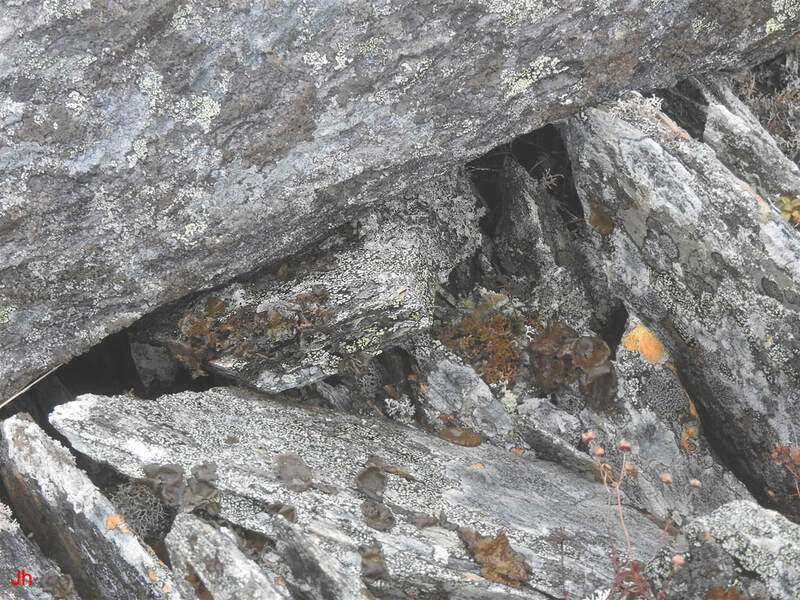 The thin fragment of presumably frost-heaved rock seen in the above closeup photo is jammed under the overlying erratic boulder and is partially supporting the weight of the boulder. In this circumstance wind-driven placement can be ruled out and it can be deduced that the thin, flat slab of rock, assuming it originated via frost heave, represents a likely occurrence of subglacial bedrock frost heave. The above diagram shows a configuration where the intrusion of an erratic into a group of layered, fragile frost-heaved joint blocks results in abrasion of the tops of the individual blocks. 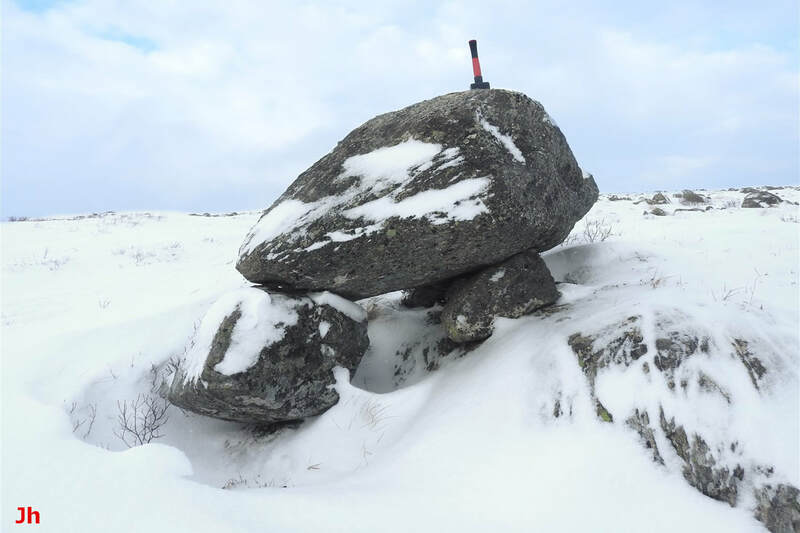 Observations of this type of occurrence in the field can provide a high degree of assurance that erratic transport postdated uplift of frost-heaved blocks. The large erratic seen in the above photo rests against a low slope where bedrock frost heave has occurred along the slope from top to bottom. The foliation in the bedrock dips vertically at this location, and small outcrop(s) of vertically-standing frost-heaved bedrock are apparent a few meters behind the erratic and just to the left of the top of the erratic. A second view of the previously pictured erratic is shown above. The picture was taken from the other side of the erratic and highlights two areas of bedrock frost heave. Details from area (1) are shown below. The frost-heave block detailed in the second (right) photo above makes a close conforming contact with the overlying erratic boulder. This type of contact suggests that the tip of the frost-heave block was abraded during placement of the erratic. A more definitive example of the same process is provided by inspection of highlighted area (2), as illustrated below. The frost-heaved joint block pictured above makes a curved, closely-conforming contact with the underside of the overlying erratic boulder. It is unlikely that a fit of this nature could be achieved without abrasion by the overlying rock. A question might arise as to why the thin frost-heaved joint block was not broken off at the base by the torque associated with the abrasion. The fragile joint block was protected by being embedded entirely in ice at the time of the abrasion. The abrasion resulted from differing ice creep rates. The creep rate at ground level was near zero, while the erratic boulder would experience blended loading by ice further from the ground, where creep rates could be expected to be higher. This example, if correctly interpreted, provides evidence for frost heave occurring under glacial ice prior to erratic placement. The two diagrams above show separate routes to the same outcome, namely a rotated frost-heaved joint block lying underneath a glacial erratic. The diagram marked "More likely" shows a sequencing model where frost heave occurs in a subglacial environment, followed by intrusion of an erratic that causes tilting of the joint block. This model is indistinguishable from an equivalent model where horizontal glacial ice loading tilts the joint block prior to the arrival of the erratic. The diagram marked "Less likely" shows a sequencing model where subaerial frost heave occurs beneath an erratic that was left behind following prior glacial retreat. The "less likely" designation reflects the brittleness of a thin joint block, high friction at the contact with the overlying rock and the need to crush and displace rock to the sides during uplift and tilting. A thin frost-heaved joint block might reasonably be expected to disintegrate under these conditions. 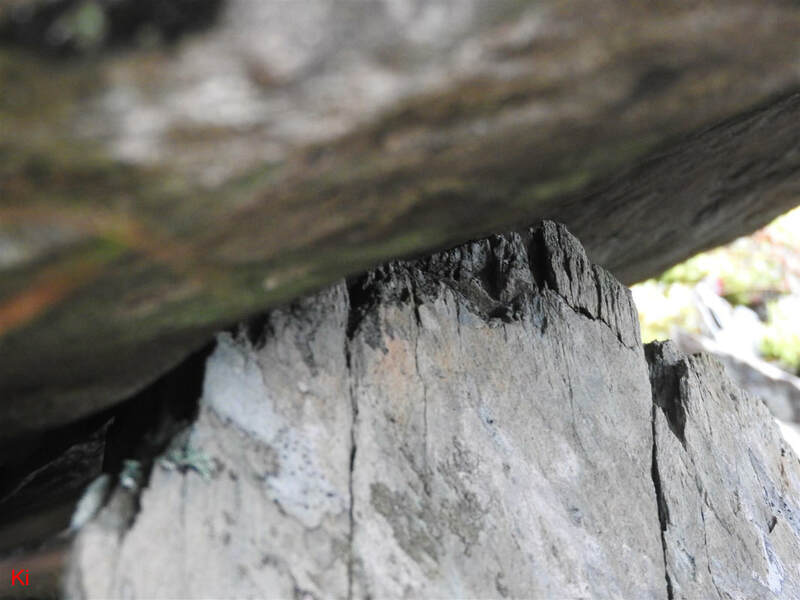 Although the foliation in the bedrock underlying the above-illustrated erratic boulder dips vertically, frost-heaved joint blocks underlying the boulder are tilted at a substantial angle to the vertical. The tilting might have been caused by intrusion of the erratic or else by horizontal glacial ice loading prior to placement of the erratic. A closeup is shown below. 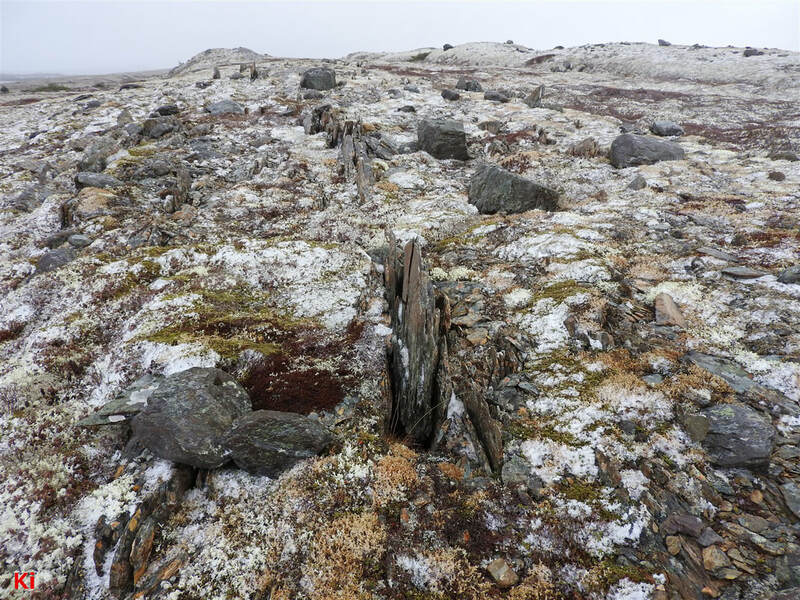 The geometry of the above arrangement makes it unlikely that post-glacial subaerial frost heave could account for joint blocks tipping inward beneath the erratic. 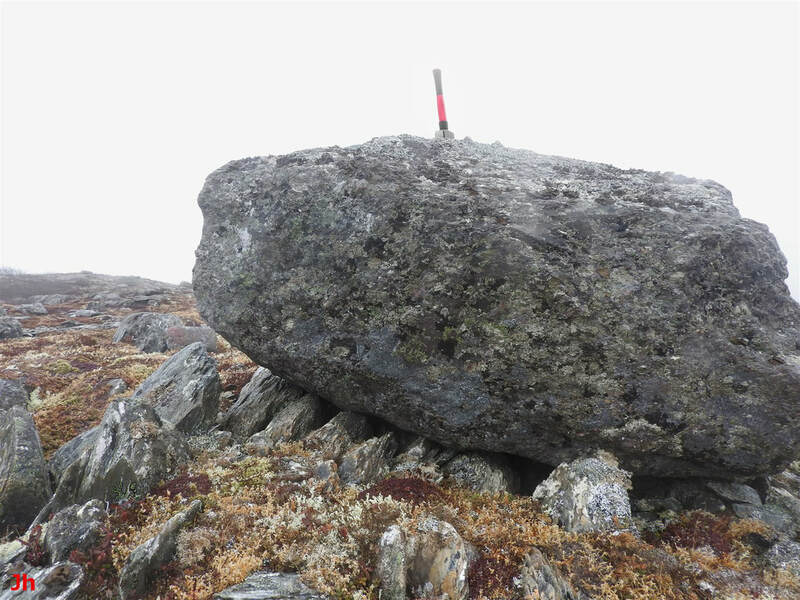 It appears more probable that the erratic settled onto an already-raised group of joint blocks that had previously experienced frost heave in a subglacial environment. 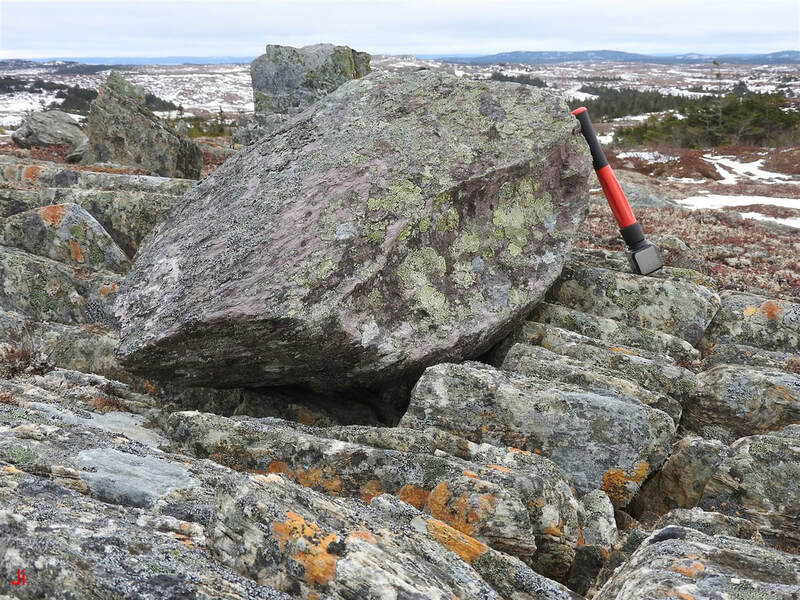 In Part 2 and Part 3 of the event sequencing analysis based on observations of erratics contacting frost-heaved bedrock, a number of additional field observations will be examined to further reinforce the theory that major episodes of bedrock frost heave occurred on the Avalon Peninsula during, not after, glaciation.